In today’s era of “All or Nothing” approaches at the plate, having a strong rotation is a must. 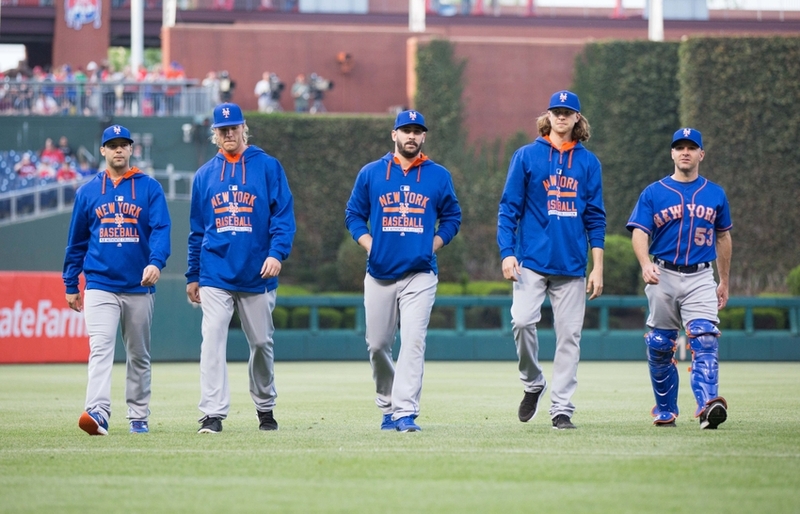 The New York Mets could and should have so much more than a “strong” rotation. When you look at the talent they have, you would think they’d rarely ever give up more than one run. With talents such as Harvey, Syndergaard, and deGrom, they should cut through the league like a hot knife through butter. Unfortunately we have yet to see all of the talent on full display, due to a myriad of injuries. Below I will briefly go over the 5 pitchers that the Mets have, which in turn will show just how dominant this rotation could be if they were all healthy at the same time. The former 7th overall pick in the 2010 draft by the Mets; Harvey made his MLB debut in July of 2012 and started his career with a bang. He struck out 11 batters in his debut; this would just be a sign of things to come. Harvey would continue to pitch well in route to becoming the 2013 NL All-Star’s starter. Misfortune struck for Harvey, however, in August of 2013. Harvey was diagnosed with a partially torn Ulnar Collateral Ligament in his throwing arm. Harvey was shut down and had Tommy John surgery (see details below) in October of the same year, effectively ending his 2014 season in the process. Harvey finished 2013 9-5 record and a 2.27 Era in 26 starts. Harvey came back strong in 2015, posting a 13-8 record with a 2.71 ERA. Harvey pitched 2015 with an innings limit to ensure his arm heath, even though there was dispute between Harvey’s agent, Scott Boras, and the Mets. 2016 would, like 2013, come to an early end for Harvey. Harvey had surgery for “Thoracic Outlet Syndrome” and was finished for 2016. Harvey is armed with an electric fastball that touches 98mph on the radar gun. He is also gifted with a strong slider and good changeup. He has the potential to be a front of the line ace with 200 plus strikeout per year potential. Another fantastic arm that the Mets have is that of Jacob deGrom. The hard-throwing righty from Stetson University was drafted in the 9th round of the 2010 draft and has become a very solid starter. Early into his minor league career, just 6 starts, deGrom needed to have Tommy John surgery and missed all of 2011. After making his debut in 2014 deGrom was awarded with Rookie of the Year, the 1st Met to win since the great Dwight Gooden. After a strong 2015, deGrom looked to be another weapon for the Mets. However throughout the 2016 season, which he pitched fairly well, deGrom was hampered with injuries. The most significant injury was to deGrom’s Ulnar Nerve, which caused numbness in his fingers, which effected his pitching. deGrom elected to have surgery on this in late September of 2016 and ended his season. Jacob deGrom is armed with a plus fastball that reaches the mid 90s and has strong secondary pitches as well. Steven Matz was the Mets’ 2nd round pick in the 2009 MLB drafted and has all of the potential to be a top of the line starter. Almost immediately however, Matz had Tommy John surgery in 2010 and did not pitch until 2012. In Matz’ debut in 2015, he gave up a home run to the very first batter he faced, Brandon Phillips. Matz fortunately helped himself out by driving in 4 runs, becoming the 1st Met to have 4 RBIs in their MLB debut. Matz pitched almost all of his 2016 season with bone spurs in this throwing elbow. He tried to pitch through it and have surgery after the season, but eventually he was put on the 15 day disabled list on August 22nd and had surgery in late September, ending his season. Zack Wheeler is yet another of the Mets power arms who we have yet to see much of. The former 6th overall pick in the 2009 draft by the Giants, made his way to the Mets via the Carlos Beltran trade in 2011. Heading into 2013, Wheeler was named the 6th best prospect in all of baseball by MLB.com. In 2013, Wheeler made his debut against the Braves and finished the year with a respectable 7-5 record with a 3.42 ERA. Wheeler followed that up with a solid 2014 going 11-11 with a 3.54 ERA, but almost like a Rite of Passage for a young Mets pitcher, Wheeler in March of 2015 had Tommy John surgery missing the entire 2015 season. Wheeler started 2016 on the 60 day DL, to ensure a full recovery, and didn’t pitch until August. Once again however, Wheeler sustained an injury and was shut down for the entire year. The final, and I think best of the Mets pitchers is Noah Syndergaard, or Thor as he’s nicknamed for his long blond hair and imposing 6’6 ft, 240 lb. stature. Syndergaard was part of the 2012 trade that sent R.A. Dickey, fresh off his Cy Young to the Blue Jays from the Mets. Syndergaard made his debut in 2015 against the Cubs at Wrigley field, not a bad place to start your career. Like fellow pitcher Steven Matz, Syndergaard was found out to have pitched almost all of 2016 with bone spurs in his elbow, though less severe than Matz’. Going into 2017, Syndergaard had to be considered one of the favorites to compete with Clayton Kershaw for the NL Cy Young award. Unfortunately, Syndergaard was placed on the 10 day DL on May 1st and was just recently moved to the 60 day DL for a torn lat muscle. When healthy, I feel that Syndergaard is the only pitcher that can challenge Clayton Kershaw as the best pitcher in the game. Now, I know that Chris Sale, Madison Bumgarner, and others are dominant, but I feel Syndergaard’s repertoire of pitches and age (24) put him ahead of the others. As you can see all of these pitchers have immense talent. They are all under 30 years old, with deGrom and Harvey being the “old” men of the group at 28 years of age. All of them have big arms with swing and miss stuff most staffs wish they had. The common denominator with all of them is (with the exception of Syndergaard) Tommy John Surgery. As a baseball fan, even a Braves fan, I would love to see all of these pitchers healthy at the same time, I think it’d be a sight to behold and a tough task for any team to score on them. Hopefully, we, as baseball fans, get to say we got to see what this rotation can be, and not wonder what it could have been. Tommy John surgery is a surgery designed to repair one’s damaged Ulnar Collateral Ligament (UCL). A damaged UCL can cause immense pain and weakness in the elbow area and effects grip strength. During the surgery the surgeon will drill holes in the bones of the elbow, the Ulna (bottom bone) and the Humerus (Upper bone). They will then take a tendon harvested from another portion of the body, usually a wrist tendon or from the hamstrings, and thread the tendon through the holes. This process will be like a replacement for the UCL. The time for full recovery from this surgery is usually around 10-12 months.